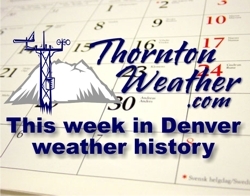 In our weekly look back at Denver weather history, we see a wide range of weather has occurred in the past. From thunderstorms to rain to big time snowstorms, we can and have seen it all. BUT CAUSED POWER OUTAGES TO ONLY A FEW HOMES. TO 60 MPH AT KENNESBURG AND TO 62 MPH NEAR STRASBURG. GUSTS AS HIGH AS 50 MPH IN DOWNTOWN DENVER. GUSTED TO 35 MPH AT STAPLETON INTERNATIONAL AIRPORT. EVEN THOUGH NO THUNDER WAS HEARD. IN 1950…STRONG WINDS CAUSED A POWER OUTAGE IN BOULDER. AMOUNTS VARIED FROM 3 TO 7 INCHES ACROSS METRO DENVER. AIRPORT WHERE NORTH WINDS GUSTED TO 29 MPH. WARMEST OF THE MONTH THAT YEAR. IN 1975…A WIND GUST TO NEAR 100 MPH WAS RECORDED IN BOULDER. TO 45 MPH AT STAPLETON INTERNATIONAL AIRPORT. RECEIVED HEAVY SNOW…OTHERS EXPERIENCED ALMOST ENTIRELY RAIN. TEMPERATURE ON BOTH DAYS WAS 32 DEGREES. 43 MPH WITH GUSTS TO 48 MPH. WERE RECORDED AT STAPLETON AIRPORT. TO 54 MPH AT STAPLETON INTERNATIONAL AIRPORT. MOUNTAINS AND ON THE PLAINS EAST OF DENVER. DEVELOPED IN THE FOOTHILLS AND SPREAD ACROSS METRO DENVER. SUSTAINED TO 42 MPH WITH GUSTS TO 48 MPH ON THE 11TH. INCHES. THIS WAS THE FIRST SNOWFALL OF THE SEASON. TOTAL PRECIPITATION WAS 0.32 INCH. GUSTS AS HIGH AS 55 MPH ON THE 12TH. This entry was posted on Sunday, October 5th, 2008 at 4:05am MDT and is filed under Colorado Weather, Weather History. You can follow any responses to this entry through the RSS 2.0 feed. You can skip to the end and leave a response. Pinging is currently not allowed. This is a great new feature. Colorado’s weather is so varied and looking at it from a historical aspect really highlights it.